Posted October 23rd, 2015 by Mobile Music School & filed under Music Lessons, Violin Lessons. The Mobile Music School are back in full swing this year with our ‘Violin in the Classroom’ programme in Rush and Lusk ETNS. Violin tutor, Rebecca Murphy, is teaching students throughout 2nd, 3rd, 4th, 5th and 6th class this term. The second class groups began lessons by making up some silly sentences to help remember the four strings of the Violin- E, A, D and G – Eggs Are Delicious Gifts and Elephant Are Delightful Giants! Third class have remembered lots from last year. As well as playing violin, the class are singing songs while clapping an ostinato. The class sing “Frere Jacques” in English and then in French while clapping Ta Ta Titi Ta throughout the song. Students from fourth class have a choice to come to violin this year. 22 students decided to take part and we have split them into two classes. 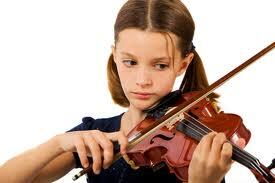 This year they are focusing on playing with the bow and backing tracks. Fifth and sixth class students are working on “The Flintstones” and “The Drunken Sailor”. This week (23rd Oct) the students are borrowing a school violin to get some practice in at home! They will be pro’s by the time we are back from midterm! !